An Environmental Protection Agency (EPA) history exhibit that opened just before President Donald Trump took office is expected lose some of its Obama-era climate displays, which could be replaced with a presentation on coal to reflect the policies of the current administration. As the Trump administration has rolled back environmental regulations, and controversial EPA chief Scott Pruitt has publicly defended the deregulation and spread doubt about climate science, EPA staff members who worked on the exhibit tipped off Trump officials that some of its content conflicts with the administration's environmental policies, according to the Washington Post. The one-room exhibit, "The Story of the Environmental Protection Agency: Protecting Public Health and the Environment," located at the Ronald Reagan Building and International Trade Center in Washington, D.C, is free and open to the public on weekdays. The exhibit documents the EPA's history since it was established in 1970 and, according to the agency's webpage, "explores how the U.S. Environmental Protection Agency protects public health and the environment by safeguarding the air we breathe, water we drink, and land on which we live." In the meantime, to make sure the current administration is represented, EPA officials have installed a large poster board in the museum, highlighting the agency's new "back to basics" agenda. 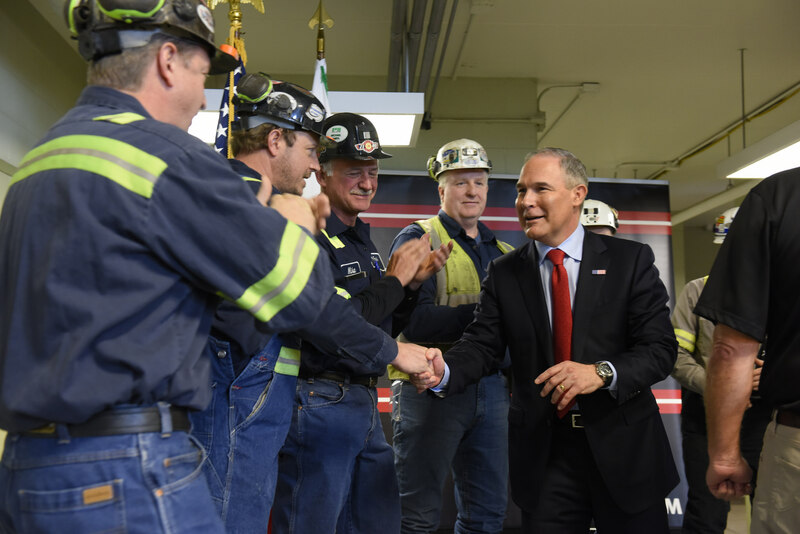 It features a picture of Pruitt shaking hands with coal miners at a Pennsylvania mine and promises "sensible regulations for economic growth." What better way to launch EPA's Back to Basics agenda than visiting the hard-working coal miners who help power America. The coal industry was nearly devastated by years of regulatory overreach, but with new direction from President Trump, we are helping to turn things around. Yet according to the EPA—at least, pre-Pruitt—burning coal, gas, and oil is the single-greatest contributor to greenhouse gas emission. The panels that are slated for removal include documented efforts to curb emissions. One details the 2009 endangerment finding, in which then-EPA Administrator Lisa Jackson concluded "that greenhouse gases in the atmosphere endanger both the public health and the environment for current and future generations"—and therefore, the agency had a legal obligation to control emission. Another panel describes the Paris Climate Agreement, a December 2015 treaty signed by nearly 200 nations that pledged to curb their emissions. The Post reported that the Paris treaty panel claims the "EPA is leading global efforts to address climate change." Trump provoked condemnation from world leaders, green groups, and the American public when he announced the U.S. would withdraw from the historic climate accord the last month. Every past EPA administrator is mentioned in the museum, with one exception: Anne Gorsuch, mother of Supreme Court Justice Neil M. Gorsuch, whose short and tumultuous tenure as President Ronald Reagan's first EPA administrator was marked by sharp budget cuts, rifts with career EPA employees and a scandal over the mismanagement of the Superfund cleanup program. She resigned in 1983.